I find this counter intuitive but can still accept the result. Again it turns out that brittleness is far less important than naturally apparent. Of course i am mentally comparing douglas fir limbs with cedar limbs which likely puts us on the two available extremes. What this tells us is that a tree fighting a wall of wind will generally fail at much the same point. That explains grove knock down rather well when it should show a random distribution of failure. An interesting and unusual result. 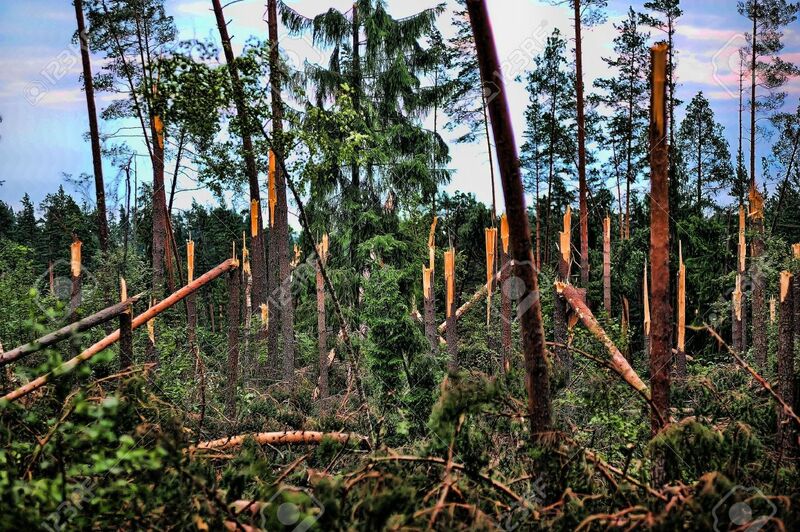 During storms, there is a critical wind speed, of around 42 m/s (90 mph), at which almost all tree trunks break – irrespective of their size or species – according to a new study done by researchers in France. Indeed, the team has shown that the breaking phenomenon can be explained via a simple scaling law, explaining why the critical wind speed is largely independent of the tree's diameter, height or elastic properties. In a strong wind, a tree may break through one of three mechanisms. Uprooting can occur in rain-moistened ground, or if the tree's roots are rotten. Alternatively, if the roots can hold, then it becomes the tree trunk that is at risk from breakage – either through torsion or, more commonly, bending. In their study, Emmanuel Virot and colleagues at the Ecole Polytechnique and ESPCI ParisTech have concentrated mainly on the latter phenomenon, which is referred to as "stem lodging". The team's curiosity about stem lodging was piqued in the aftermath of "Klaus" – the 2009 cyclone that caused widespread damage across parts of Europe. 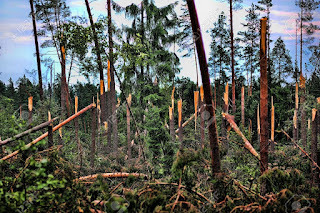 Data collected after the storm showed that the greatest damage to forests occurred in regions where the wind speed exceeded 42 m/s – irrespective of tree age and type, with both softwoods (e.g. pines) and hardwoods (e.g. oaks) affected similarly. The resistance of wood – often in relation to construction – has received considerable attention over the centuries, with inputs from such recognizable names as Leonardo da Vinci, Galileo Galilei and the Comte de Buffon. All previous experiments have concluded that a tall, thick tree (or, at least, wooden beam) should be as strong as a short, thin one – but no consensus had been reached on the exact scaling laws in play. To explore this further, Virot and his colleagues conducted experiments on horizontal beech rods. While mechanical differences between different tree species are slight, beech was chosen as a wood with average proprieties. Fixing one end of each rod, the researchers applied increasing weights to the other end, measuring the curvature of the bending rods until they broke. This occurs close to the fixed end of the rod, at a critical curvature radius related to the diameter and length of the rod. Using this relation, and replacing the weight with a model of wind force, the researchers developed a scaling law for the critical wind speed at which trees break. Taking into consideration that trees nearly triple in diameter for a doubling in their height, the researchers showed that the critical speed is only very weakly dependant on the tree's physical dimensions – a doubling in tree height only increases the critical speed by 9%. The elastic properties of the wood seem to have a similarly small impact. "We studied why all trees break at almost the same wind speed, and found an explanation based on fertile results of mechanics and biology such as Euler's elastica equation, Griffith criterion and tree allometry that describe, respectively, elasticity, fracture and tree shape," explains Virot. "The result is that trees break at approximately the same wind speed, despite their biomechanical differences (size, age, and species)." Barry Gardiner, a silviculturist at INRA Bordeaux-Aquitaine who specializes in wind damage and was not involved in this study, calls the work very interesting, and a good springboard for helping us to understand better the controls on wind damage in trees. Gardiner cautions, however, that the conclusion of a weak dependence of critical wind speed on tree height appears contradicted by previous studies of storm impacts – which have reported that tree height is a very important predictor of the likelihood of damage. "From a biological point of view, it makes a lot of assumptions that simplify the natural world," he adds – noting that the model assumes a steady wind state and complete branch shedding, two factors that are not typically reflected in real storms. "Another thing that's important to remember is that trees are living, so they're adjusting and acclimating to their environment all the time – they're not a passive engineering structure." The research is described in Physical Review E.